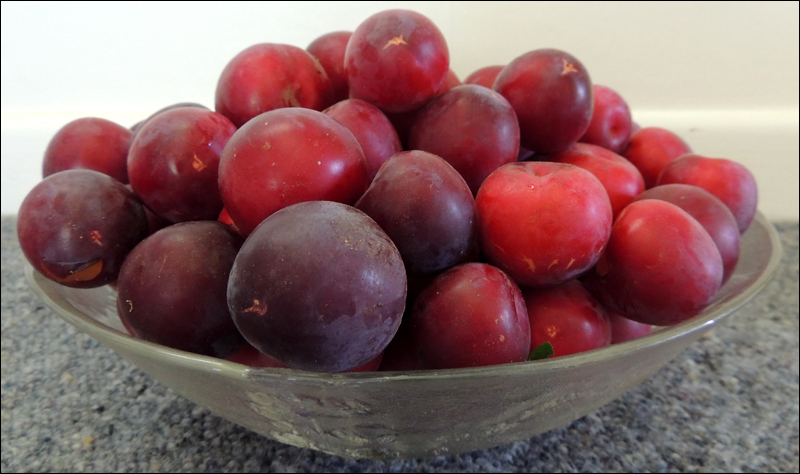 We’ve picked just about the last of our plums today. We’ve had so many plums this season, despite the wind that destroyed so many in mid-December. 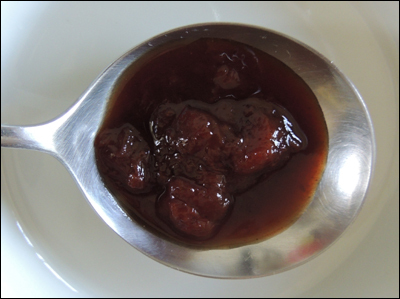 I’ve been making ‘Plum Everything’, including having started a batch of plum wine. But I think there is nothing nicer than a Plum Jam, as it’s so versatile. This year I decided to invent a spicy version – and it’s turned out extremely well. For the spicy component I used Habanero that I’d grown last season and had frozen, as our current plant is too small to produce any fruit yet. It’s been a slow season in the garden due to the inclement weather in December. Habanero is my absolute favourite chili pepper. 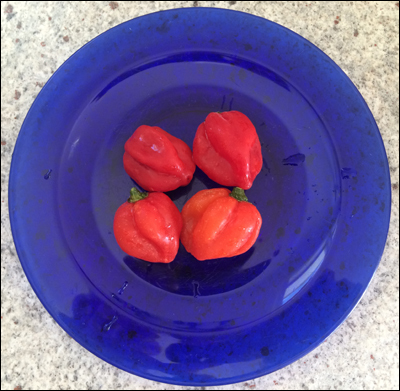 It has such an amazing flavour – very fragrant and fruity, as well as the excellent kick it provides (it rates as 100,000 to 350,000 on the Scoville Scale). This jam is not for the faint-hearted, but it’s definitely worth making. It can be added to sauces or used as a condiment just as it is, or (of course) spread on your toast as a rich and spicy jam. 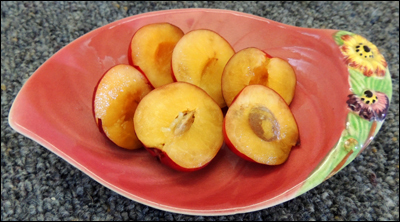 Our lovely yellow-fleshed, red-skinned plums. Chop the plums up roughly and put them in a large preserving pan. Sprinkle the sugar on top and let them sit like this for an hour or so, stirring from time to time to help the sugar dissolve. 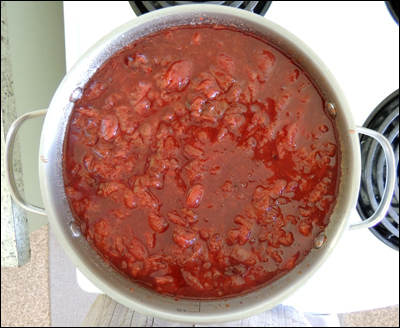 Second boiling of the sauce. Bring this slowly to the boil, stirring at frequent intervals to prevent anything sticking to the base of the pan. Once boiling steadily, maintain the boil for about 10 minutes then turn off the heat and allow to cool to room temperature. Repeat the above process 3 times (or more if you would like a thicker jam). The main thing to remember is that you have to stir frequently, especially while you are waiting for the fruit to come to the boil, to avoid the fruit sticking to the bottom of the pan and scorching. If this does happen, don’t panic… transfer the jam to another container without scraping any of the ‘caught’ jam from the bottom of the pan. Wash the pan then carry on with the process. You can stop and start with this recipe easily. A dollop of spicy jam. Some of the jars of jam. You can see the lovely dark colour it has developed. 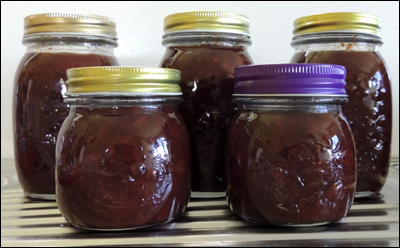 You could use yellow-skinned plums for this recipe, or even greengages, but the red-skinned plums give the jam the most wonderfully rich colour, even using yellow-fleshed plums as I have. I began with 3.5 cups of sugar and then tested the flavour part way through the cooking. It was then that I decided to add an additional .5 of a cup. It’s a matter of personal taste and also, the sugar level in the plums themselves. Also, I like to cut down added sugar where I can, so I tend to start out with a bit less in a recipe such as this, and then add more if I need to. The above recipe has been adapted from a recipe I found on the Natasha’s Kitchen site.